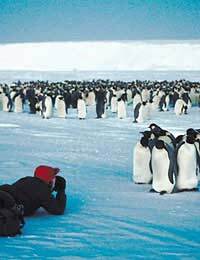 Tourism and photography go hand in hand and while coming home with pictures of your trip plays a big part in mainstream holidays, if your get-away was a once in a lifetime eco-safari, then it becomes even more important to get those photos. There is a saying that the responsible tourist will “leave nothing but footprints, take nothing but photographs” which is obviously relevant in particularly sensitive environments, but the principal holds equally true anywhere. Wherever your destination and whatever the type of holiday, you can aim for low-impact photography and often it only involves a little bit of awareness, thought and effort to do the simple things right. If you really want to capture the true essence of any animal and give a true reflection of it in your photographs, then a certain amount of research is called for. Some kinds of creatures can be particularly sensitive at different times in their lives – and many will be especially protective of their young or breeding sites. Photographing many species – particularly birds – when they have young about can be especially stressful for them and may lead to the parents abandoning the nest – and the young it contains – if they feel too intruded upon. Larger species too can share this need to maintain their privacy – and getting on the wrong side of an overly protective rhino mother, for instance, is no laughing matter. Picking the right clothing can be a great help; the more you can blend into the background and cease to exist from the animal’s perspective, the more likely you are to get that “natural” shot. While camouflage outfits obviously enable you to achieve this relatively easily, in some parts of the world, wearing “military” clothing can get you into very serious trouble – especially if you are also carrying a camera. Again, a little research before hand is likely to help you avoid a lengthy spell in a foreign prison cell on suspicion of spying. Even if photographing gorillas in the mist is not for you, you can still do your bit by taking a good look at what you are carrying in your camera bag – and indeed the bag itself – especially when you are toying with buying any new equipment. If you are trying to take wonderfully arresting images of baby seals, or lions on the Serengeti, it is probably a good idea to carry the thing through and find out as much as you can about the manufacturer’s stance on “eco” matters. There are many things to consider in a company’s environmental policy, such as how the impact of manufacturing is minimised, what are the waste disposal arrangements, does it support any conservation projects or carbon offsetting initiatives. It is unlikely that any one manufacturer will fill all your own particular environmental tick-boxes, but it does at least enable you to satisfy yourself that you have done your best. Even if you are happily using an ageing classic and have no intention of ever changing, it is still worth going through the exercise; you will still be buying new films – and possibly filters and the like. Time was, there was simply no contest; if you wanted “serious” quality photos, you had to use film – and ideally transparencies rather than print. While the digital/film debate still rages, the one thing which is certain is that today’s top – and even middle – of the range digital cameras offer image quality that could only have been dreamed of a few years ago, making the contest a much more even-handed affair. In the end, it really comes down to personal preference. Although it has been argued that the manufacture of digital cameras is more energy intensive and places greater demand on resources than their conventional counterparts, the chemicals used in film development are not exactly without their potential problems. To help you get that treasured hard copy of your digital image without harm, a number of printer manufacturers have made great strides towards improving the environmental performance of their products – such as the new ‘ozone free’ FS range from Kyocera. Whether we are photographing wild habitats and their inhabitants or taking more mundane tourist shots, photography – like all things – has environmental impacts, some of which are seen and some unseen. Minimising our own personal contribution can be effective, but only if we take the trouble to get to grips with the problem in its wider context. From Bergen to Botswana, from Mumbai to Majorca, the principles of eco-photography remain the same. A carefully chosen selection of photographs to show amongst your friends is one of the great joys of travel and with a little forethought and planning; no one need feel that they have to miss out. Wherever you choose to take your break, your photographs can be the most eco-friendly of souvenirs.